Tone 10 is the Day of Manifestation. Under the trecena of Star/LAMAT our Spiritual Harvest will be Multiplied to Abundance. 10 Earth/CABAN is a Manifestation of Movement. We have been learning to Move by Intention, making a choice of how we would Love to Experience our Life on Mother Earth. We chose to live by the unlimited possibilities of our Spirit, instead of our Human limitations. Manifestation is a Great Blessings with a Great Responsibility. We will only manifest what we Believe and Claim as True. The Aztec mark the days of Ollin (Earth/CABAN) as a Time and Place where we are offered a Vision of what we are Becoming. Like Mother Earth, we’ve turned our Self around. Over the Tzolk’in round, we’ve been rotating through all 4 directions. We’ve looked at 13 Sacred Steps to Creation through 20 different Divine Perspectives of Being. There’s no way we would be the same after intending to see things in so many different ways. The manifestation of seeing our Earthly Experience in new way is the inevitable result. Another inevitable result would be seeing one another in a new way. We’d recognize the blessings that every perspective could bring. We could see the Blessing of being different. Unconditional Love offers Human the freedom to be anything we choose. Knowing an Eternal Love, we could see our “different way” as an Expression of Love that is all of our own making. A new world is born to us by the Wisdom of our own Experience. Mother Earth was the gift of Time by her movement. In the Beginning, the Omega was the All-in-One. The Maya’s closest definition of God is the Hunab Ku, all that ever was and all that could ever be, the unlimited potential for anything and everything. The One Divine Consciousness knows everything all at once. The K’iche Day Sign is N’oj. They define CABAN as the source of all Knowledge and Wisdom. N’oj is a Sacred Word to the K’iche that acknowledges “Knowing” as Divine. It sounds like “know” with a breath at the end. 10 Earth/CABAN is a Manifestation of the Breath of Divine Wisdom and Knowledge. The Aztec define this day as “lucky” for the “active principle” and “unlucky” for the “passive principle.” We weren’t created to all go along with the same ideas. We were meant to discern our own experience, and Honor our own Perspective. We would Know our own Truth, by considering many other perspectives. Through a comparison, we would discover that what we first thought was “different” was, instead, “unique.” With our Spiritual eyes open, we would recognize the miracle that the 7.5 billion humans on Earth each represent a wholly different experience of Mother Earth, and a one-of-a-kind perspective. We didn’t come off an assembly line. Each one of us was created by Hand. As long as we keep moving with our own Divine Intention, we will always end up in the Light. All it would take for Human to Believe in a Divine Creator is to open our eyes and look around. We never expect a newborn to be like someone else. There’s a miracle in imagining what will make them different from anyone else. The only sameness we hope for is a physical resemblance, that will identify them uniquely as our own children. In the turn of our last 4 directions, we’ll end up in the Light of 13 Sun/AHAU to identify our Self as unique in our own Resemblance to the Creator as the Spark of a Greater Light. It was made possible by everything we Learned from Mother Earth. We were made from the Inspiration of the Father planted in the Womb of Mother Earth, made of Her flesh and blood. We would hold all the Magic of the Love exchanged between the Alpha and the Omega, a Creation of Love from our beginning to our end. Today we claim the Higher Consciousness of our own Divinity of BEING… a BEING Conscious of its Identity of Spirit, and Conscious of the One from whom we were created, and Conscious that we are perpetually turning to the One Brightest Light that shines for ALL. The photo of Earth was our first Vision of the Whole of Mother Earth. We were all changed by what we saw. In a realm of black and white, Earth was set apart by the Beauty of her Colors. We suddenly saw beyond the 4 directions to see that her Beauty extends to the Universe. We were inspired by a Vision from Above to Love the Whole of Mother Earth. It was a new beginning. Human saw the need to take care of all of her. She is like nothing else we’ve seen among all the Stars Above. We’re still looking, believing there must be another somewhere among the billions of stars. We’ve extended our sight through telescopes that can see thousands of light-years away, though we still haven’t found ANYTHING that compares to her Beauty. Her Beauty is a reflection of all the Conditions that support the Life of Human Being. This first vision of Earth was seen at the December solstice 50 years ago. 1968 was a year of great turbulence and chaos of change. The youth of America rose up to create a different way of being. In 1968 I was a senior in high school. It was the first time we saw our friends shot down in a war that we had nothing to do with. We were given no choice but to participate in the “draft.” We were living the “Hunger Games,” sacrificed to an Intention we didn’t even understand. We were preoccupied by the fear of wondering who’s number would be chosen next. In such darkness it was easy to see there had to be a better way. So have the children of today been sacrificed for reasons that none of us understand. For the sake of their own lives and the lives that follow, the children who followed will manifest the better way. Through the Higher Consciousness of our Ascending Turn, we can see the Earth Rising Again like the first time. We can see Mother Earth as we’ve never seen her before. We can remember she was created a Jewel in the Darkness. We can count on Mother Earth to always maintain her Beauty that was created by the Intention of a Divine Creator. Within the Creation itself was a Promise that, what was made Beautiful in the Beginning, would be Beautiful to the End. In one of Carl Calleman’s articles he shares the idea that it is possible for a catastrophic event to fulfill the Creator’s intention to return us to Harmony and Equity, though, we’d have to start all over again. Human was given a Choice. Through a Divine Transformation Human could Rise to the Occasion and see the Earth as it really is, instead of “black or white.” We were created to Complete the Beauty of Mother Earth. Through the extension of Human Consciousness, our Beauty would shine together to infinity. The only way we could fail is standing still and standing by, without bringing our Light to the darkness of the world. We could only fail, waiting for someone else to do what we were ALL empowered to do for our Self. The Creator made it easy. All we had to do was try to Love and pray to Love to be Changed by Love. For the Sake of Love, we could ask to Know the Wisdom of Forgiveness. We can accomplish anything beyond our Human limitations, by placing the Dream in the Creator’s hands. We only had to make the Choice to Love to keep the Beauty of Mother Earth in Balance. We were elevated to Higher Consciousness to claim the Whole Beauty of Mother Earth. With the eyes to see her from Above, we can remember the Miracle that we were placed here, a place of Life where we could Grow. Any “other” spaceships flying by would see her as a place that was Special to Be. Our population could be seen in its right size. From the billions of places we could be, this Place was given to the Chosen Few. We are all the Ones Chosen for the Experience of Earth’s Beauty. We consider “one in a million” as the odds of a Miracle. The odds of being here are multiplied to abundance. We only have to look at the numbers consciously to see the odds of the Miracle that was God’s Gift to Human. The Cherokee Heron is a creation of perpetual movement to the next place of Abundance and Beauty on Mother Earth. The Heron is a symbol of the Phoenix that rises from the ashes of its past. In our last turn, we are rising from the ashes of an old vision of Mother Earth. Given a New Consciousness of Being, we are rising to see Mother Earth for the very first time again. Seeing the Whole of everything she is, so could our hearts be captured again for a whole new beginning of Loving of our Time and Place with her. We could see Her as a Place Designed to reflect the Divinity of the Creator, a living place where Love is perpetually Reborn. We exist in a season of Miracles. There have been so many miracles in my life this year. The more I look, the more I see. I’ve forgotten that Santa has yet to make an appearance. I can’t imagine any more Abundance than what has already been created in this 4th orbit of the Haab year. 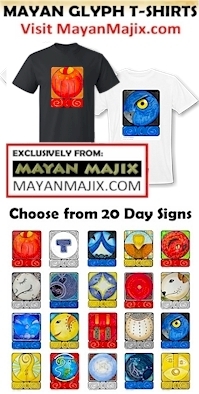 The Mayan calendars calculate 52 years of the Haab as raising Human to maturity. The seeds that were planted in 1968 still have two years to go. The Ascension of the Dreams planted in 1968 are on scheduled for their own Ascension of Wisdom and Understanding in 2020. The Year is guided by the Year Bearer 8 Earth/CABAN. The Earth we first saw rising in 1968 will be guided to its Zenith Position for the Sacred Exchange of her Divine Justice. We’ve gained the momentum. In the full turn of the planetary year, Human will realize our own Power to maintain Harmony and Equity, in Balance with the Above and Below (7 Road/EB/Human). The Beauty of Mother Earth will rise again. To all my relations, may we see our Self as a Divine Body in Motion, recording the Beauty of Mother Earth. May we see that the Revelation of the Whole of her Beauty is something that could only be seen through the billions of Human eyes that see her, and Human Hearts that Love her. May we Know how much we’ve always Loved her, even when our eyes are turned away. May we Know that it only takes Consciously Seeing her Once with our own eyes to Believe such Beauty was meant to last as long as there were Human eyes to see her. May we claim an Ascension to a New Consciousness that will see her for the first time. May we claim the New Beauty we see as a manifestation that was created by Humans that wore flowers in their Hair and believed in the Future and a New Age of Aquarius. Each age is calculated as 2,160 years as measured by the movement of the Constellations. Many calculate the 20th Century as the beginning of the new Age of Aquarius. May we claim the manifestation of an Intention, created by the children who came before. The Dream they imagined was the freedom to Be and Live for their own Intentions. May we recognized that their Dream was aligned with Divinity, and their creation was Paid Forward for us to see. We are the children that followed. May we see the Truth that we followed the dream they imagined. May we claim that the New Human rising has Ascended High Enough to see the Value of ALL Life on Mother Earth. May we go to Mother Earth with a Blessing for everything our New Eyes are capable to See and Acknowledge. May we Believe for Her that we will rise to the occasion to manifest the Harmony and Equity intended as the Beauty of the Whole. May we thank God that Mother Earth was created as our Time and Place, a Miracle beyond all the odds that we could measure. Through our Consciousness of Her, may we Claim that Human, Being, is a Miracle. Earth/Caban: Keeper of the garden of Earth. Profound synchronistic connections to Earth’s natural cycles and energies provide power of creations and memories of ancient wisdom. Earth persons help dispel bad intentions, habits and ideas. This makes them very good counselors and masters of all arts. Studious and intelligent, Earth persons endeavor to bring a flow of natural order to all aspects of life. Being connected to the dynamic forces of nature, Earth persons need much liberty to facilitate their expression of migration or the sending of long distance communications such as the whales, elephants, birds and many other creatures. Sometimes Earth’s delicate sensitivities are upset resulting in quakes of emotion even the display of volcanic temper.